It's easy to create the illusion of a custom built-in look you've been dreaming of for your retail store. 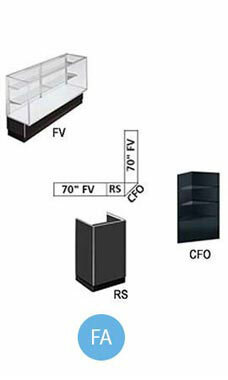 This Black Metal Framed Display Case Arrangement Set consists of two 70" Full Vision Display Cases, one Open Front Corner Fillers, and one Register Stand. All of the essential display pieces are constructed from black melamine laminated surfaces with satin finished clear anodized aluminum frame extrusions. Among its many features, the full vision display case features tempered glass top, sides and front, so customers can carefully examine the merchandise inside. The corner filler display is essential for tying together your showcases, offering two additional shelves for display. The register stand is the final piece to the arrangement, perfectly capable of storing supplies, tools and store essentials, as well as your computer or cash register. It's everything you need from one showcase arrangement. All display cases come fully assembled, and shipped in wood crating for security. Available for immediate shipment.